Once I had sketches and a rough idea of how I was going to build this thing, it was off to the client for his approval. Approval in hand, it was time to get to work. After getting the actual models, I sat down and began to convert my concepts into a real model. Now for the reality of building this guy. Aside from the other requests, there were two things I needed to do with this model. PROBLEM: Make the Skulltaker interchangeable between his chariot and a regular 40mm base. 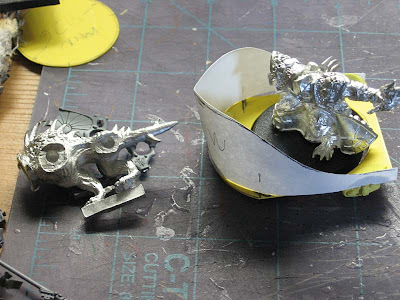 SOLUTION: Make the chariot big enough to nest the 40mm base inside it so it can be removed and the Skulltaker can be played as mounted or on foot. PROBLEM: Make the whole thing fit on a base that wasn't so big it caused problems during game play. 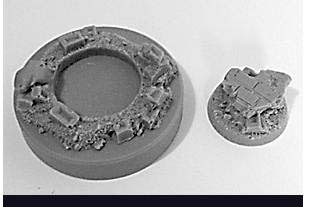 SOLUTION: Scratchbuild a bullnose base (similar to Space Marine bike bases) that is 60mm wide by using a 60mm round base and cutting it in half and extending the middle slightly. And here's the first attempt at mocking up the chariot itself. I don't have a chariot here, I have a boat! The scale of this thing makes the Flesh Hounds pulling it look like kittens. It borders on looking like he's riding on a parade float. This was so pathetic looking it nearly killed me to see my idea sitting there. Time to start over from scratch. And then it came to me... 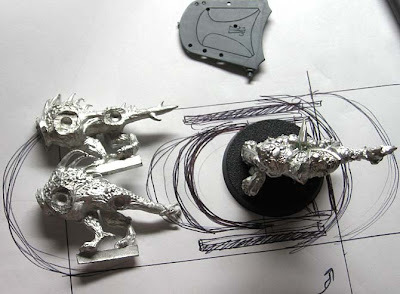 I remembered seeing a pack of "display bases" at my FLGS where there's a removable 25mm base set inside a 40mm base. The texturing is the same on both bases and you can mount your model on the 25mm base for play and then set him in the 40mm display when you want to look at him on the shelf. Perfect! I'll do that... or something similar. I decided to mount the Skulltaker on a 25mm base and then make it so that he could be set inside the chariot or a 40mm base. This way, he could be used on foot or mounted. A few magnets to keep things together where needed and I was back in business. Sorry to hear that you have had such a frustrating time with this chariot so far. No worries though, it can be done! This is my first time building something using a combination of GW bits and scratchbuilding. It's a little tougher than just converting a model. Even harder would be building entirely from scratch I'm assuming. I found patience and having a plan of what you want in the end really helps keep you on the right track. You've got to know what you want your end result to look like otherwise you can get sidetracked easily. That's a great solution, and one that I'll have to try (once I start that inevitable Daemon army). Not to be a party pooper, but aren't Khorne chariots pulled by Juggernaughts, not Flesh Hounds? A chariot is a chariot, but that might help make the steed for your chariot look more formidable. Wienas: Honestly... I have no idea. I just build what people ask me to. I wish I could offer more insight when it comes to questions you guys have. Sometimes I feel like I robbing you by saying "That's what my Client wanted" because it doesn't help you guys understand everything else that went into making the decision to do one thing over another. I'm just a super-geek that spends a bit too much time reading army books for armies that I don't play. I'm sure whatever you make will look awesome, as usual. While the fluff says the chariots are pulled by juggers I like the flesh hound take on it, a refreshing change and should look nice when finished. I have to design a Tzeentch chariot for my daemon army so I will follow this thread with interest. I intend to have my chariot pulled by giant seahorses. Giant seahorses is the best idea ever. I'll look forward to seeing that. I'm not gonna lie... seahorses is a cool idea. Good luck, it's a fun model to build and definitely worth the effort.